Let’s add a Source field on blog posts, to allow us to fill in an external URL from where the original content was produced. Declare the new field in the model properties. Activate the cache mechanism of models properties. We’re going to listen the event on the model config file. Create the file local/config/config.php by copying local/config/config.php.sample (if necessary). When activated, all models properties will be cached in the directory local/cache/fuelphp/model_properties/. When a column is added and not declared, the first call to get() or set() for this column will fetch the schema from the DB and update the cached properties . This mechanism only works with the MySQL and MySQLi drivers. 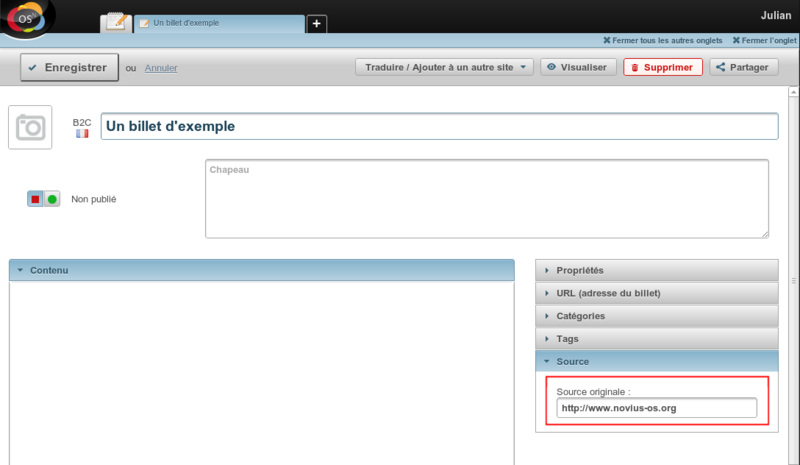 Documention for Novius OS configuration. The addition / edition form of a blog post is defined in its CRUD configuration. To extend it, we’ll use an event! For the view, let’s create the local/views/apps/noviusos_blognews/front/post/content.view.php file.